There is a new vegan icecream shop in South Fremantle, so all you vegans and vegetarians go and support it. ROHO BURE is is next to Callogero near Lefroy Road and also sellss shakes and cakes, no doubt also vegan. 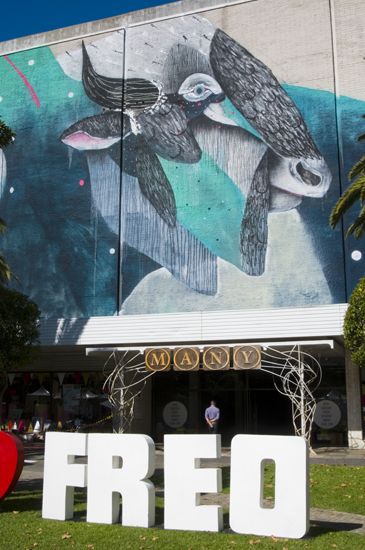 It is going to be a wonderful warm weekend in Fremantle so why not start the day with creativity and colour and the excitement of new artwork all over town. I love the PUBLIC2015 symposium organised by FORM and wished I could have gone to some of the lectures. 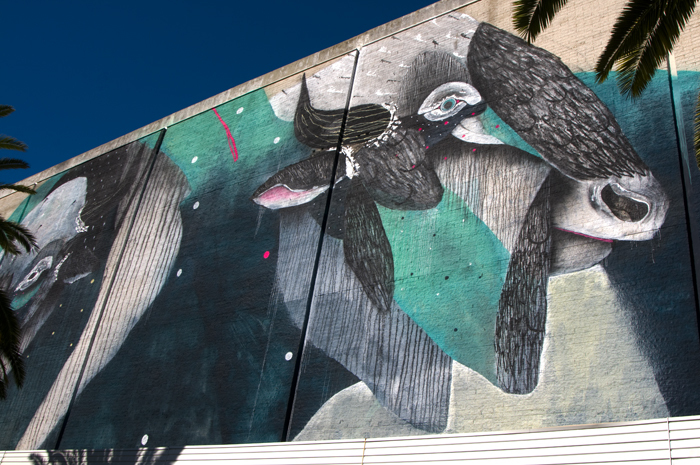 IS MURAL ART DISRESPECTFUL TO ORIGINAL DESIGN? He argues in his lengthy article that the artworks are disrespectful to the designers, architects, builders, visions, concepts and that the artists use the buildings as if it was a blank canvas that is not part of the entire building design and streetscape. “The work of millions of man hours subjugated by a fresh approach and a cavalier attitude.” David Weir writes. I especially love the massive and stunning buffalo painting by artist TWOONE above the MANY 6160 entrance but I do believe that David Weir has some valid points here. There is a certain arrogance in believing younger generations know better and we might as well paint the pyramids in Egypt red or get TWOONE to paint one of his giant and delightful buffalos on an ancient church because that old style is no longer relevant to modern living and architecture. It’s a bit like Photoshopping the hell out of great landscapes because the artists knows so much better what it should look like than nature does. I believe David Weir has a point an that it would be an interesting discussion PUBLIC2015 and the wider community should have.